Professional Upholstery and Sofa in London. Got a nasty coffee stain on your pretty bright green sofa? Don’t hurry to cover it with cushions and hide it. Better call Thomsons Cleaning which offers highly efficient and affordable professional upholstery cleaning services in London and the area. The company offers a same day emergency cleaning upholstery cleaning service if you can’t stand watching at the stain for another day too. The professional cleaners can also offer to deep clean your carpets, rug, curtains, mattresses (including bed bug treatment), draperies and blinds. 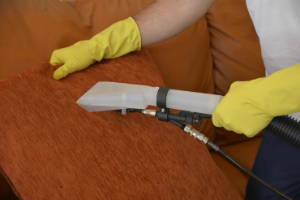 You can receive a non-binding and absolutely free upholstery cleaning price offer for upholstery cleaning services right now, by calling 020 3746 0000 or sending an online request. The customer care hotline is open 24/7, so call now! The professional cleaners are equipped and trained to safely, efficiently and successfully dee clean any kind of upholstery material, including: leather, wool, silk, suede, synthetic, cashmere or other on any kind of upholstered furniture, including: different kinds of sofas, chairs, stools, armchairs and curtains. The cleaners will inspect the upholstery and will pre-treat any stains on it before dry or wet deep cleaning it to perfection. The cleaning teams have a wide variety of perfectly safe and yet very efficient stain removal products as well as cleaning detergents to wash your upholstery and make it look like new. The cleaners provide their professional services to both domestic and commercial customers in London and the area. The main types of deep cleaning offered by the company are: steam cleaning and dry cleaning. Depending on the type of textile, the appropriate type will be chosen by the professional cleaners. The steam cleaning method is more efficient, but is not suitable for many types of textiles. Steam cleaning involves actual shampooing and rinsing of the upholstery and then extracting 95% of the water back in the steam cleaning machine. Steam cleaning is very efficient for the extermination of germs, dust mite and other microorganisms which probably reside in your furniture. It will wash off all dirt and other residue as well. The upholstery will be completely dry in about 3 hours, or if you request an air moving system - almost immediately after the washing. Dry cleaning involves fry upholstery cleaning foam which is sprayed on the upholstery, inserted into it with a machine under pressure and then let to work and vacuumed off with a professional hoover. Since leather upholstery is a much preferred upholstery type for home and office furniture in the area, the professional cleaners from Thomsons Cleaning are very well trained and experienced for cleaning this type of material. The cleaners use special cleaning solutions to clean the leather upholstery and to rejuvenate it. They can also treat small flakes and other damage to the leather. Once the service is provided, your furniture will look shiny, clean and as good as new! Treating the leather upholstery with the appropriate solutions and conditioners is crucial, so that the leather doesn’t dry up and break, which is why it is highly recommended to clean and treat it professionally at least once a year. The professional cleaners also use special methods for cleaning suede sofas as well as other delicate materials which can’t be treated with water. Note that we aslo deliver expert carpet cleaning. In order to book the professional upholstery cleaning services of Thomsons Cleaning all you need to do is call 020 3746 0000 or use the online booking form. The customer care service operators are available 24/7 so you will be receiving a written confirmation for your booking within 2 hours. No deposit is required, the payment is done after the cleaning is done, and the fee is fixed, with no hidden charges. If you book another cleaning service like curtain, draperies, mattress or carpet cleaning along with the upholstery cleaning then you will receive a very serious discount from the price!